Off the Welsh coast out on a sea trial , prior to delivery ! Falkland Fisher 500 at the pontoon. This one is fitted with a new Tohatsu 40hp fourstroke which performed extremely well. A Falkland fisher 500, on its mooring in Etang du Moulin Neuf Brittany France.One of many we export to Europe. 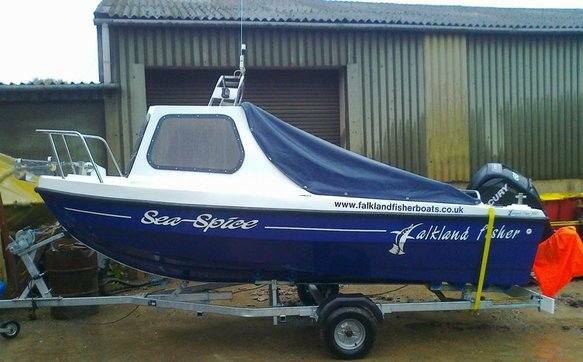 We are the manufacturers of Falkland Fisher Quality Fast Fishing Boats . With a unique gullwing Hull concept , with the Hull built on a hard wood keel, for added strength as standard (unlike most boats in our class), it gives an exhilarating ride when on the plane and an excellent stable platform when at anchor or on the drift. These boats are certainly built to last ! It handles a rough sea as good as a smooth one! giving an extremely dry ride. 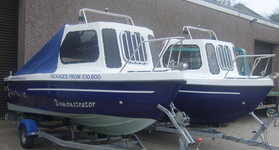 The Boats came into being due to local demand for a trailerable dinghy,capable of handling rough seas, big enough for four or five anglers yet small enough to easily launch and retrieve by one angler.It will give you 15 knts with a 30hp outboard , and 25 knts with a 40hp outboard in the right conditions. An optional extra well worth considering is a 12v Anchor Winch. Making your day's boating even easier ! The completed boat with a 60hp Mercury 4 stroke. A serious piece of Angling Kit which will give performance and economy.
" Falkland Fisher Roller Coaster Easy Launch Trailer ". Getting your Falkland in and out of the water is "a piece of cake " ! 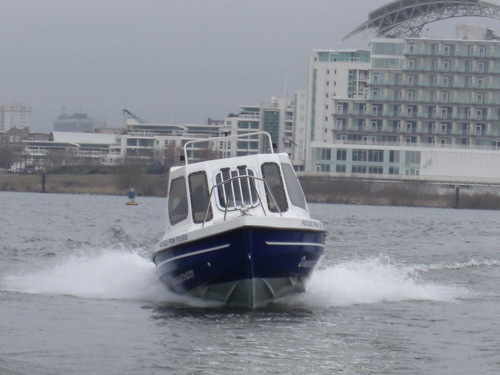 The Boats have superb handling and lateral stability and with speeds attained of over 30 knots with a 60hp outboard fitted ,it has a real turn of speed to get out to fishing marks or into shore quickly if the weather deteriorates! "At first glance you can see this is a boat that has been designed with the serious angler in mind . I can sum up the Falkland Fisher in one word- exhilarating" ! "This really is a cracking little package that offers a superb combination of the practicality of a serious angling boat with a high level of top end performance". "I got nearly 30knots out of it which is fast enough for anyone " !! Dave Barham of "BOAT FISHING MONTHLY" RECENTLY WROTE after visiting us at our stand at the Southampton Boat Show. 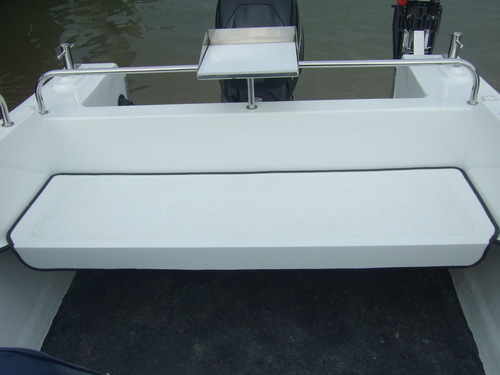 "The boat has been designed by serious boat anglers and as such is packed full of exciting and functional ideas." "It was great to finally step on one and you get an awful lot of fishing space" "We'll definately be doing a full on test soon !,"
The Falkland Fisher 500 has some surprisingly innovative features which come as standard ! Polycarbonate windows are bolted over the GRP to prevent rogue waves pushing them in, essential if fishing over sandbanks or in shallow water . This is a standard feature on all Falkland Fishers. Another Falkland Fisher 500 Package ready for delivery! This one is destined for Dorset, England. The Falkland Fisher 500 has many improved safety features compared to the MK1 versions, including a raised cuddy and increased freeboard all round.There are new internal mouldings and increased buoyancy as standard.The Falkland Fisher 500 really sets the pace and lasts it! The built in moulded anchor locker is massive ! Ideal for keeping warp / anchor , retreival buoy etc out of the way and off the main deck or seating area . This is self draining . 5" sampson post also come as standard, unlike the majority of our competitors who use cheap, imported plastic fittings etc to maximise profits and sacrifice Build Quality! Our heavy duty PVC Fendering is second to none ! Complete with End Caps . Compare ours to our rivals ! They don't come near to us with quality ! There 's plenty of head room in the Falkland Fisher 500 which incorporates a cuddy big enough to sit in, whatever your size, and enable you to escape the elements. A cushion set is available to improve comfort and is worth every penny when at sea all day! 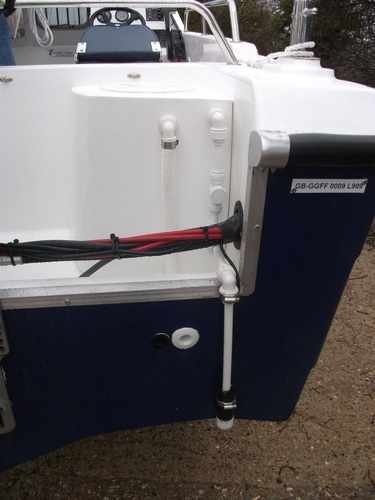 A Baulkhead with a lockable door is available as an extra (standard on the Premier) and is ideal if you want to keep tackle, equipment etc on your boat under lock & key. Visibility is not greatly impaired when seated at the helm as a polycarbonate window is incorporated directly above the console . There is also a window fitted into the port side baulkhead, to further aid visibility. This is the deck space looking from the cuddy towards the stern. for up to four anglers . A fixed fuel tank option can easily be incorporated at manufacture, underneath the floor. A rear moulded seat is yet another standard feature. 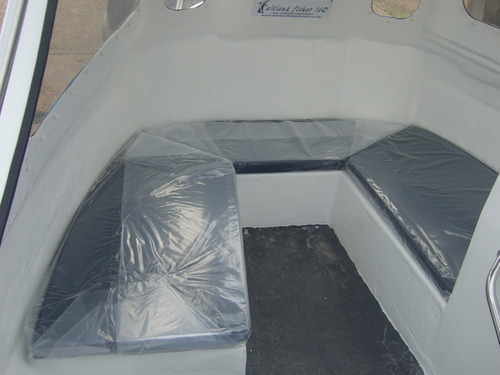 It utilises space and enables the other anglers on board to sit in comfort while travelling to the fishing grounds. This is easily removed in seconds for increased fishing space ! It fits under the engine well in front of the fuel tank, out of the way and not taking up valuable Deck space. 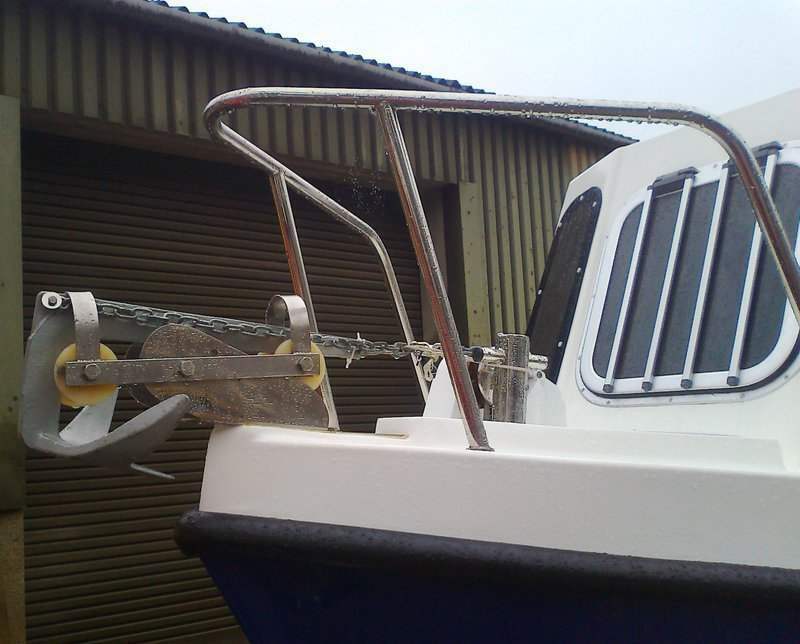 It can easily be pulled out and re- fitted for travelling to and from fishing marks. 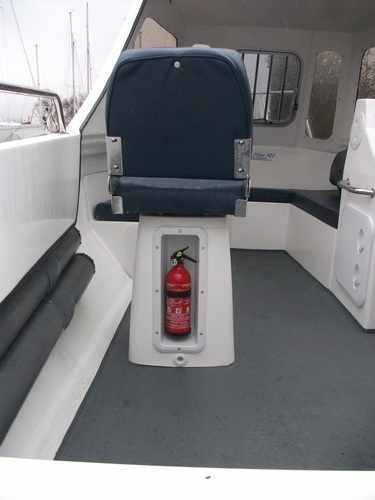 The second man's seat showing the built in fire extinguisher and rod tubes built into the hull side which are a great touch ! These were extra's requested by the customer and were worth every penny ! 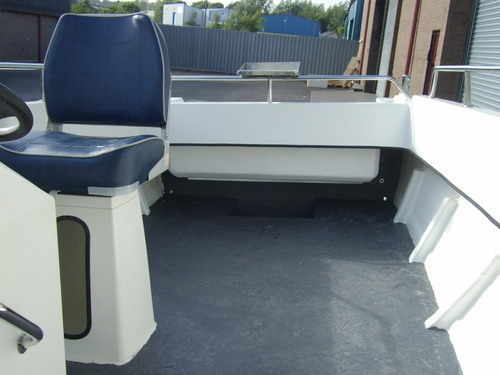 Lockable , stowage lockers are fitted port & starboard sides into the moulded bunkboxes and also the steering console which houses the batteries. 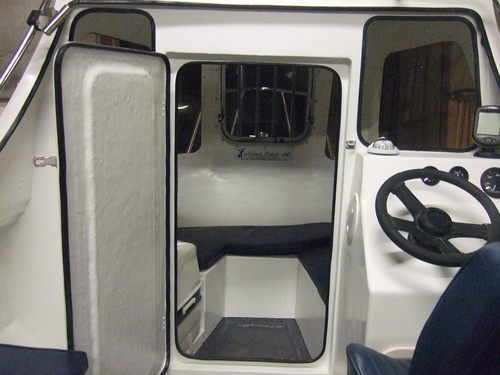 This gives loads of dry storage space - essential on any boat this size .Under the swivel helmsman seat , another open stowage area is built in . The Falkland Fisher 500 (formerly 160) incorporates quality stainless steel rear sampson posts 4" instead of conventional cleats . This makes life far easier when securing ropes / fenders etc ,and really do look the part ! 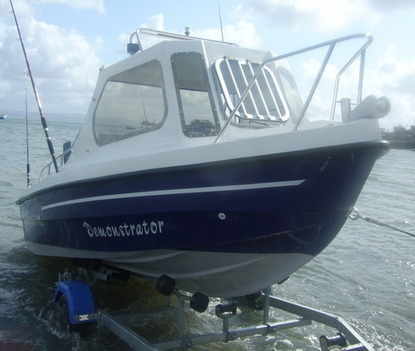 The large engine well means that the Falkland Fisher 500 can easily accommodate twin engines ! This is an important factor when deciding which boat to buy as it gives more options on use etc and is something that the majority of boatbuilders seem to have forgotten! It also makes embarking and disembarking relatively straightforward. A non slip floor finished in grey gel coat to reduce glare off the sun is a hard wearing standard feature that is essential in any fishing boat . A livebaitwell tank complete with pumps and all plumbing is an extra well worth having. The size of the tank, makes it ideal for joey mackerel as well as sandeels and as it's built into the engine well, there's no loss of space inside the boat. All Boats are built using the very latest hi-tech materials which are all Lloyds approved .The Boat is built incorporating an english oak hard wood keel ,this is totally encapsulated in GRP for 100% protection, ideal if a keel band is reqd .This also gives the boat exceptional longitudinal strength. Buoyancy is present throughout , rendering the vessel virtually unsinkable . The steering console has a spacious feel to it with plenty of room for electronics to be fitted .The steering position is perfect for standing or sitting .It's your choice ! The floor area incorporates an underfloor foam sandwich between two laminated skins and a Hardwood Ply floor which is fibreglassed and sealed, prior to the application of the non slip gelcoat . 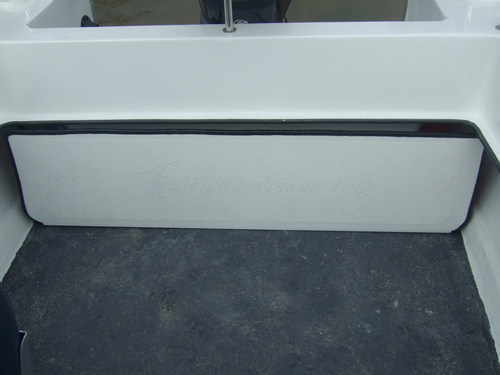 The bow also has buoyancy built in which increases strength and suppresses wave slap noise at anchor . A portable fuel tank can be located in a purpose built hold below the engine well or a tank incorporated under the floor as a fixed fuel tank option. 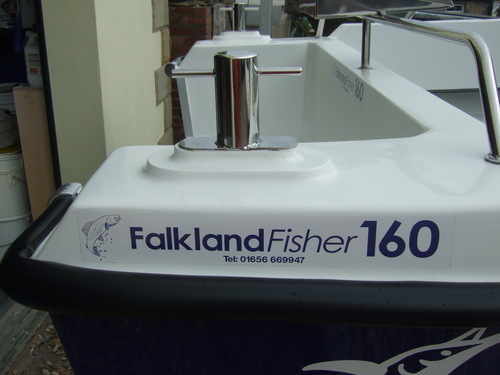 A Fuel Filter / Water Seperator , which is bolted through the engine well is another option on your Falkland Fisher and is a great piece of kit , ensuring that your engine receives the cleanest fuel possible! There's still plenty of room for the bilge pump.The batteries are fitted in the steering console well away from the fuel ( for safety ) . For any specific requirements , please ask ! it's no trouble! GGF recommend up to a max 40hp single engine long shaft or Twin 20 HP engines standard shaft (due to the Hull configuration) for Both Models. MERCURY, MARINER & TOHATSU Outboards. 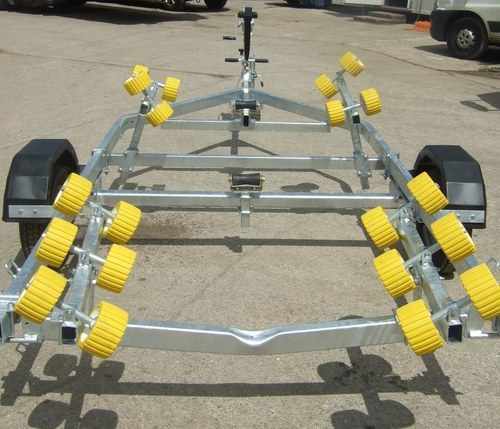 Indespension Easy Launch Roller Galvanised Boat Trailers.